This form is to be used by returning members wishing to renew their membership. Individuals wishing to make application for a new membership should use the "Apply Here For New Membership" prompt. Please enter your current address. Enter "None" if you don't currently own a car. Please fill in serial number of your vehicle if you wish to get a V8 Registry metal tag for your car. Please enter a brief description of your drivetrain to assist in documenting your car for the V8 Registry chassis number tag. I.E. - Mid engine small block Chevy, 4 spd manual trans. BASIC MEMBERSHIP - $15.00. 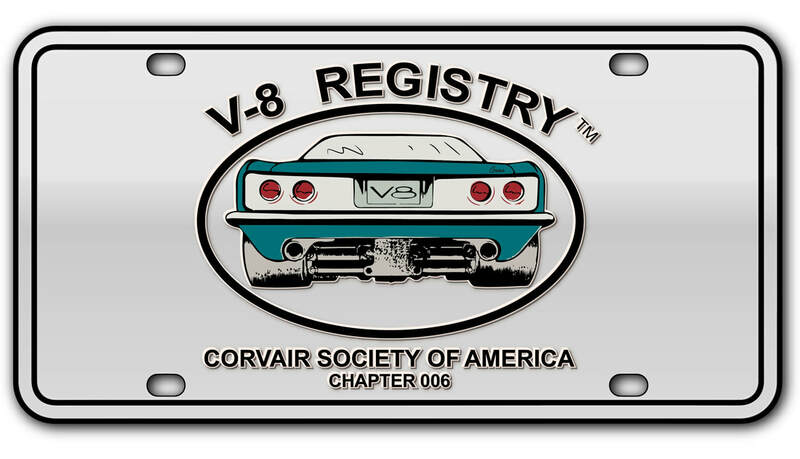 Includes listing in the confidential V8 Registry Member Roster, a personal web page on the V8 Registry web site with details and photos of your Corvair conversion. Also included is access to the V8 Registry Forum web site. DELUXE MEMBERSHIP - $30.00 ($37.00 for memberships outside of the U.S.). Includes all components of the Basic Membership, plus a T- Shirt. If paying by PayPal, you will be directed to another page after checking the correct box below and clicking on the "Submit Application" box. $15.00 Basic Membership With Payment Using PayPal. $15.00 Basic Membership With Payment By Check. Please forward your payment to the V8 Registry Treasurer Paul Beck at 48222 185th Ave., Pearl, Illinois 62361 $30.00 Deluxe Membership With Payment Using PayPal. $30.00 Deluxe Membership With Payment By Check. Please forward your payment to the V8 Registry Treasurer Paul Beck at 48222 185th Ave., Pearl, Illinois 62361 $37.00 Deluxe Membership With Payment By Check - For Memberships Outside The Continental U.S. Please forward your payment to the V8 Registry Treasurer Paul Beck at 48222 185th Ave., Pearl, Illinois 62361 $37.00 Deluxe Membership With Payment Using PayPal - For Memberships Outside The Continental U.S..
Be sure to check the most appropriate box or the system won't allow you to submit your request. INTERNATIONAL PAYMENTS MADE THROUGH PAYPAL OFFER THE EASIEST EXCHANGE OF CURRENCY. INTERNATIONAL MONEY ORDERS DRAFTED ON AN AMERICAN BANK OFFER A SECOND METHOD OF PAYMENT. MAILING U.S. DOLLARS IS A THIRD METHOD, BUT NOT RECOMMENDED. CHECKS WRITTEN ON A FOREIGN BANK CANNOT BE ACCEPTED FOR PAYMENT.